Marking its first foray onto the London art scene, pioneering Turkish gallery Pi Artworks is proud to present Pi: Housewarming, its inaugural exhibition in the British capital. At its new space on 55 Eastcastle Street, in the heart of London’s bustling Fitzrovia district, the exhibition will act as a sneak peek of the gallery’s programme for the upcoming year and features works by both established and emerging Turkish and international artists, including Volkan Aslan, Nezaket Ekici, Susan Hefuna, Horasan, Nejat Sati, Gulay Semercioglu and Mehmet Ali Uysal. 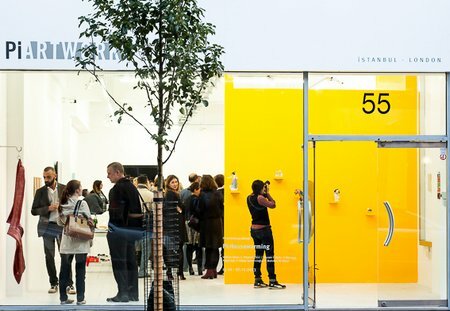 Pi Artworks is one of Istanbul’s foremost Contemporary art galleries. Established in 1998 by Yesim Turanli, it is currently located in the famous Misir Apartmani in Galatasaray, Beyoglu and is responsible in large for the establishment of Turkish artists on the international art circuit. To this effect, internationally renowned German/Egyptian artist Susan Hefuna will present a series of drawings and silver bronze sculptures, while Turkish Gulay Semercioglu will show some of her iconic woven metal pieces, the sheen of hundreds of kilometres of thin metal wire reflects different plays of light. Volkan Aslan’s metamorphosed and re-appropriated porcelain figures create a phantasmagorical world of their own, while Mehmet Ali Uysal continues his play with space and form through drooping, empty frames, reminiscent of meat hanging from a butcher’s hook. Meanwhile, Nejat Sati creates ethereal colour palettes in acrylic, creating floating, serene works that are contrasted with Horasan’s intricately detailed and yet smooth oils on canvas. Finally, performance artist Nezat Ekici presents a series of stills from her performance, Flesh (No Pig But Pork).